I don't have very much else to say about furniture polish. Ahhhh! *dramatic gasp of surprise* I just might be speechless! OK, not really. For me to be speechless, it would have to be a really, really, really, really rare occasion. I mean really rare, I don't do speechless. It would have to be a family-member-just-told-me-that-they-had-super-powers-and-then-flew-me-to-the-moon-to-look-at-the-earth kind of special occasion, ya' know? Mix the olive oil with the white vinegar. Put it in a squeeze bottle. 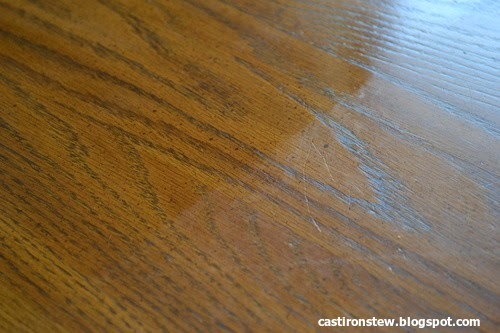 When you want to use the polish, squeeze it onto a rag and polish your wood. Use it sparingly, you don't need a lot of it! If you are just trying the recipe, you can make a smaller batch, because a little bit goes a long way! Even after I tried it and made a new batch, I still didn't make a full recipe. Thanks for being an awesome reader!